Hey! I'm trying to port my client's sites from Kirby to Automad, but I stumbled upon a thing that I really don't know how to solve with Automad. I mostly make block-based pages, so even if it's not a blog I have many children pages, for cards that are then shown to organize the page a bit simpler and to make it possible for clients to easily add new content blocks to their site. Anyways, is it possible to give the homepage specific-homepage related children? I got a Jumbotron and then beneath that 3 cards with short descriptions and links to other subpages and these cards are organized with a subpage under the homepage for each single card. Somehow it's not possible to simple make childs to the main-page because then they'll be on the same level as all the other subpages. 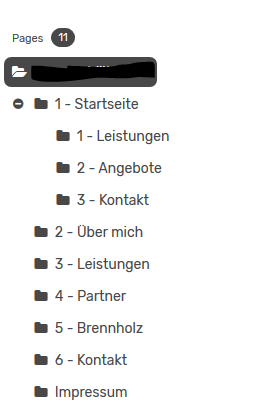 To solve that I then created a subpage "Startseite" and put the cards in there but now when someone visits the site he'll still get to the mainpage and not site.com/startseite. But when you want get the children of another page, like one of the first level, simply set the context to the URL of that page like /startseite. Please note that there is technically always just one single homepage on every website. The top level pages are direct children of the homepage then. You can find more info about changing the context in the docs.